Blastrac surface preparation equipment can be used on airfields at aprons and runways to reinforce grip by increasing the surface friction. They can also be used for airfield rubber and line marking removal, to improve light reflection and reduce vibrations & noise levels during takeoff and landing. Modern airport runways have to be capable of safely landing turbojet aircrafts with their greater weight and high landing speeds. Under certain conditions aquaplaning or unacceptable loss of traction can occur. This results in a longer braking distance and possible loss of directional control. 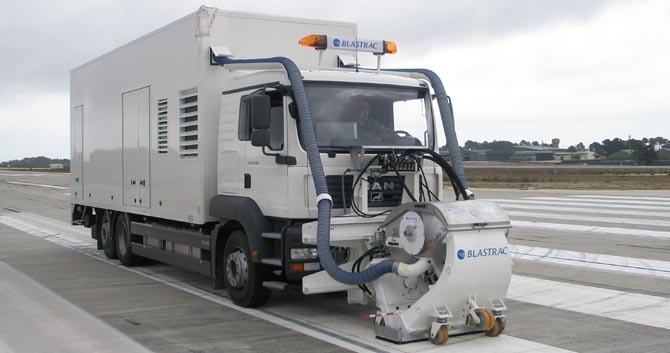 Blastrac shot blasters can be used to clean and retexture runways in order to restore skid resistance. Airport aprons, runways and taxiways endure a lot of heavy traffic all day long. Avoid investing in repaving a complete new surface by removing rubber & line marks and retexturing the surface on a regular basis.